The other day I jotted down “It’s not a resolution, it’s a plan”. I keep coming back to that phrase. I get a little annoyed at this time of year with all the ‘I don’t make resolutions because resolutions don’t work’ talk. There’s something of an embedded excuse in that. It’s obvious that most people don’t keep their resolutions, though. I get that. So if it’s a matter of word choice, let’s just go with it, shall we? Resolutions don’t work. But you know what does? A realistic plan broken down into small, achievable pieces embedded in a community of support. I won’t link you to all the studies. But they’re there…oh, yes they are! Here’s one of the things that’s really working for me. It’s part of my Bullet Journal. 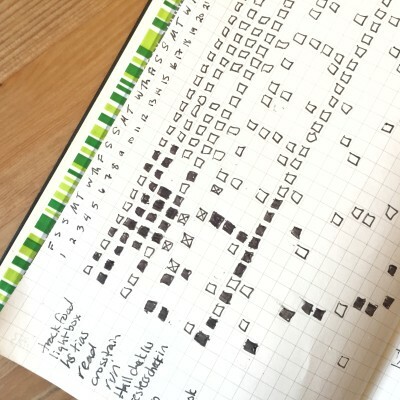 Now, a bullet journal isn’t anything fancy. It’s just an incredibly flexible system for making sure you have one place to track your lists and ideas. It’s simple and powerful and anything you need it to be. The habit tracker is new to me, though. I started it in January, so I’m still very fresh to it. It solves a problem I was having with either A) having to write the same things in my To Do list day after day after day, or B) forgetting some of them. I like that it gives me one place to do a little scheduling for things that come up often. Along the top of the page are days of the month. Along the side are habits or tasks. There are things for health, pieces of my goals for the GoalAlong, housecleaning tasks, volunteer work reminders, etc. To keep it visually clear, I put a big sticky note on it (when I’m not photographing it) and that blocks off all the days still to come. An X in the box means I was unable to do it for reasons beyond my control. (Working out hasn’t been possible this week because of a hip issue.) A blank box just means I didn’t do it, and I don’t judge myself. Some days just don’t have it all. I’m building habits, not competing in Perfect Person 2016.